Pictured below are the ingredients, the blender containing eggs, butter and sweeteners, the finished batter, and the baked cake layers. Not shown: Me pigging out, eyes rolling back in my head from the pure decadence! Use a fool proof recipe and a common kitchen tool to create a delicious and healthy cake! In place of white flour, I used ground almonds, oat flour, and whey protein powder to make it gluten-free and diabetic-friendly. It’s a truly magical combination of ingredients, as this cake batter yields a lovely texture even after heavy blending, and stays moist for days! 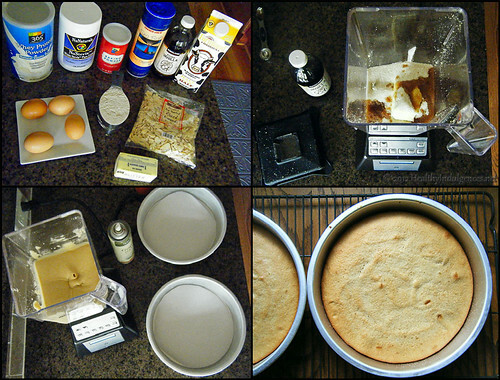 I get my gluten-free oat flour from iherb.com, but if I’m baking this cake for friends who can eat gluten, I pick up whatever oat flour is available from the grocery store (usually Arrowhead Mills brand). Alternatively, if you have a Blendtec or other high power blender, you can make your own oat flour from oats. Any vanilla whey protein powder low in carbohydrates should work well in this recipe. 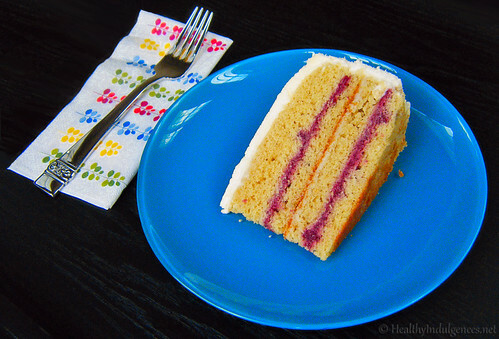 Using a serrated knife, I cut my 2 cake layers in half to make a 4 layer cake. For the fillings, I used sweetened raspberry puree and an experimental dairy-free vanilla cream frosting. 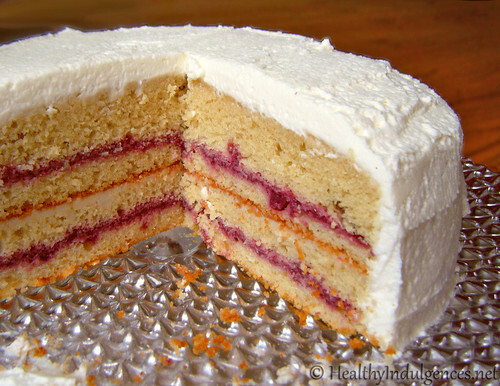 These fillings require a few steps to make, so I’d suggest making a 2 layer cake using the white whipped creamy frosting recipe below as the filling and topping if you’re pressed for time. A sugar-free chocolate buttercream frosting with this moist yellow cake would be out-of-this-world too. The possibilities for this cake are only limited by your imagination (and your schedule!). This recipe is Wheat Belly and Trim Healthy Mama-friendly. It would be an “S” treat. *THM Sweet Blend works well here, too. Preheat oven to 375 degree F. Grease 2-9 inch round cake pan, or 16 cupcake liners with grapeseed oil cooking spray or melted butter. Sift a little oat flour on the inside of the cake pan to ensure that the cake comes out easily. Using a Magic Bullet blender or coffee grinder, grind up sweeteners and sea salt until powdered. Wait until the “dust” inside the canister settles for opening your Magic Bullet and dumping contents into mixing bowl. Using a hand blender, beat together butter, erythritol, xylitol, and stevia for 2-3 minutes, or until butter is light and fluffy. Scrape around edges of blender bowl with spatula. In a separate mixing bowl, whisk together dry ingredients. Crack your 4 eggs into a glass measuring cup. Turn on hand mixer and start alternating between beating in the eggs and dry ingredients. Mix in an egg, then mix in a little bit of the dry ingredients. Keep adding eggs and dry ingredients until batter is just beaten together, smooth and free of lumps. Do not overmix! Scrape into cake pans. Turn on blender and start alternating between adding the eggs and dry ingredients. Mix in an egg, then mix in a little bit of the dry ingredients. Keep adding eggs and dry ingredients, pulsing until batter is smooth and free of lumps. Do not overmix! Scrape batter into cake pans. Insert cake pans into middle rack of oven, then turn oven down to 325 degrees. Bake 20 minutes. Remove pans from oven and place on a wire rack to cool. Cut around edges of cakes and invert to remove from pan after 5 minutes of cooling to finish cooling. Frost and enjoy! With a hand mixer, beat cream, sweeteners, and salt on low until soft peaks form, then increase speed of mixer to high until cream stiffens (like this) but doesn’t look gritty (like this). Do not overbeat! Scrape in mascarpone and vanilla, and beat just until incorporated. « Indulge in Healthier Baked Oatmeal for breakfast! Comfort food that’s low carb and protein-packed. Looks absolutely YUMMY! Do you think I could sub coconut for oat flour? Do you think it would work if i substituted liquid rice malt syrup for sweeteners and coconut flour for oat flour? (which is what I have in the pantry today) . I love cake, this looks delicious. I love the colours and I would love to try this recipe. Unknown and Cath – Unfortunately, coconut flour would not work in place of oat flour. It performs very differently, sucking up a lot of fat and liquid. It would make the cake very dense! I think it would actually be able to stand in for the whey protein if you added an extra two eggs. That's just a hunch. 🙂 I sure hope you can get your hands on some oat flour to try this cake! Brandon – Me too! I'm trying your buttercream when I get home and have my stand mixer. Did you see I linked to it at the bottom? It looks perfect for this cake! So happy you shared it with me. Seygra- Thank you! The raspberry puree adds a colorful touch. 😀 Hope you get the chance to try this cake! Thanks! Hope school year is going well! Hi, Dave! I use the conversion from powdered sugar to granular sugar for converting my powdered erythritol to granular erythritol. It's 2.2 cups powdered sugar to 1 cup granular, but google it to check (I'm on the road now!). School is out for summer do it's been lovely being able to bake more. Thank you for asking! UPDATE: I changed the butter in the recipe to unsalted. Oh man…how could I forget you were on break? Sign of advanced aging! Maybe bc last time I left I left a comment it was before Christmas break! I could not find what appeared to be a reliable conversion so I sent a letter to Netrition.com with the question. I'll post an answer when I get it. Welcome back, Lauren! And talk about coming back with a bang… This looks FABULOUS! Can't wait to try it. Love the raspberry layers, but how to decide: White icing vs Chocolate Buttercream??? DaveS: Interesting about Tricenta LLC. I like Netrition, so am not appalled, but do find it curious. using a blender to make a cake is a brilliant idea… it's so efficient and i won't have to wash so many dishes and bowls afterwards! Now that's interesting and I hope it's accurate and that it helps the readers of your blog. But I think it's kind of scary that there's a product we are consuming and it's nearly impossible to find and contact the company who makes it! CJ – Thank you! I appreciate the thoughtful nomination you gave the blog, by the way. 🙂 Sorry I didn't catch that nice comment of your earlier! It is easy enough to figure out. Just blend up a cup of granular E in a food processor or magic bullet and measure the volume of what is left. 🙂 If I find the time, I'll do just that and post it on the blog! Thanks for reminding me of this important question, Dave. Cakewhiz – I'm with you on not liking the dirty dishes! Blender cakes are ideal for the lazy baker. 🙂 Please let me know if you get to try it. I'm trying to learn how to be White flour and Sugar free. I like your all you have done. Thank You! Can you just use Xylitol in this recipe. On the package it says i can use on one to one like sugar. the Erythritol they're referring to is the granular one. There was a question later on in the forum about it. I've never heard of most of the sweeteners they've listed. And there's also no listing for xylitol. Now I 'thought' I read that erythritol is only 70% as sweet as sugar, but xylitol is somewhere like 160+% as sweet. But I don't like using very much xylitol because of the after effects. Adriel – You're welcome! You could use xylitol if you can tolerate that much of it in one recipe. 😉 My system doesn't handle it so well so my recipes use as little xylitol as possible. I think this is useful stuff. I have never blogged or posted a comment or given a review on the internet. I absolutely love your blog and your recipes. The chocolate cake with beans was amazing! One request- can you work on a new pizza crust recipe? I have tried one similar to your blog (thin, cheesy, crispy) and others that came out too cakey with soy and almond flours. I am seeking a traditional thin crust that really tastes like the real thing without the carbs. I know you would be more successful than me! Thanks again for your wonderful recipes and please never stop blogging! This looks delicious, and it's going to be a great recipe for me to bake for my dad's upcoming birthday (he's diabetic). Thanks for sharing this one with us! Oh, Lauren, thank you, thank you, thank you!!! These are delicious! I froze them and when I took them out, put them in a covered plastic container to thaw, they tasted fresh and moist a couple hours later. I am new to your website, and all your recipes I have tried are wonderful! I will SO be buying a cookbook from you when you put one out. Thank you so very much for not just your recipes, but your knowledge of nutrition that you share with us-I have learned so much from your articles you write. Thank you! Anon – What a great idea! As soon as I can get more almond flour I'll play around with some crusts . It'd sure be great to have a “real” tasting g-free low carb crust! Dianne – Glad the cupcakes turned out for you. It's great to know they can be frozen and thawed out without a change in their texture – thank you for sharing that with us! Hi! My family (that usually turns their noses up at anything “healthy”) LOVES it when I make this cake! However I have a problem: I want to make this when I'm having a guest with nut allergies. Is there any way I could replace the almond meal with coconut flour? I know it makes stuff more dense but I haven't actually cooked with it yet so I don't REALLY know how it behaves. Any advice? Thank you! I wanted to share some information I recently heard in regards to protein powders in baking recipes, such as this one. I had gone to GNC to buy some whey protein isolate, to try and make my own protein bars, and the sales clerk told me that most protein powders will lose a large portion of their protein if exposed to high heat, like it would be in baking. He said the only powder he’d heard of that can be baked and still maintain the protein is Any Whey, which they didn’t even sell there. So I’ve been making the freezer protein bars, but wanted to let you know since you’re using protein powder in this and other recipes. I haven’t done any serious research on this, other than to look up Any Whey online and the label says it can be baked, while no other protein isolate I’ve looked at has said that. Love the blog, keep up the good work! Hi Lauren – Great blog! I’ve been looking for sugar-free gluten-free recipes on line and am so happy to have found your blog! I love that you use mainly combinations of erythritol/xylitol/stevia to bake as that’s what I believe to be the best healthy sweeteners based on my research and the advice from celebrated nutritionist such as J. J. Virgin, etc. This recipe looks so good and simple so I’m definitely gonna try it. I don’t have whey protein powder though. If I skip this from the recipe will that affect the texture or flavor? Can I sub with something else that I may have on hand? Thanks for all your great work! Way too complicated. Will not be making this one. Just because you are using a blender doesn’t make it simple. What can i use instead of whey protein?? Could i use another type of flour??? Protein powders are not very popular in my country so its hard to find them! Thanks!! Lauren, I have enjoyed your fun and informative blog for well over a year and this is my first comment because I cant contain my gratitude any longer! Thank you so much! ALL of your recipes are amazingly delicious, so good in fact that my sugar loving sweetheart asks for more! I just made your busy day blender cake and it takes the cake! Delicate, moist, sweet vanilla goodness, oh my! I made cupcakes and enjoyed with fresh whipped cream…pure heaven! I appreciate your blog and all of your fantastic delicious creations that you share with all of us! Is there anything at all that can be substituted for the oat flour? It’s just too high in carbs for me.. I’m thinking about trying this with 1/4 cup of coconut flour subbed in for the oat flour, and adding 2 additional eggs. It sounds like it might come out more dense, but do you think it will still work? Hi Stacy. My friend made this with Oat Fiber instead of Oat Flour, it was awesome and more in lower carb range!!! this alternate topping is delicious!